A book review on this blog was long due as past few posts have been food related. It is not that I have not been reading books, it is just that I have not been able to sit and write about it now. 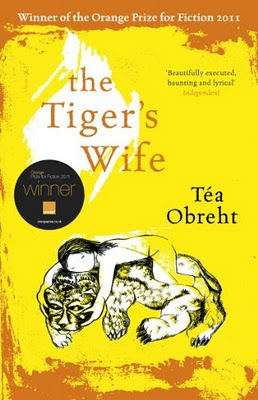 I have to write about three of the books I have read oflate, The Tiger's Wife by Tea Obreht being the first one. I had bought this novel intending it to read on my way to India. I could manage to read more than half of it then and had to put it aside in India. Finally today I have finished reading it and have put it down. If I had to say about this book in a few lines, I would say that I have never read anything like this before. It is a fascinating story that threads reality and folklore in a way that is spellbinding and unforgettable. The story revolves around two main characters- a grand father and his grand daughter, and two stories with each having their own protagonists. Of course there are other characters that have their own importance and relevance in the novel. The story is set in a war torn Balkan country and the readers get to have an insight into how war affects a nation and its people, how if brings about changes in human behavior and anarchy in human social system. The grand father is actually a physician and a great lover of animals. The story starts with the granddaughter, Natalia Stefanovi, who like her grand father is also a doctor and is on her way to a medical mission to administer vaccines to children in an orphanage in a remote village. It is on her journey, her grandmother informs her of the grand father’s death. Her grandfather was nursing a disease which Natalia had known for a while. What made her curious was the fact that her grandfather had died in a clinic in a small obscure remote village named ‘Zdrevkov’. Remembering childhood stories her grandfather once told her, Natalia becomes convinced that he spent his last days searching for "the deathless man," a vagabond who claimed to be immortal. As Natalia struggles to understand why her grandfather, a deeply rational man, would go on such a far-fetched journey, she stumbles across a clue that leads her to the extraordinary story of the tiger’s wife. Natalia is the narrator of the story and as the story progresses we come to learn about her life in fragments. The story shifts between past and present, folklore and reality and the result is a compelling, eloquent and enchanting tale that will stay in your thoughts long after you have read it. There are some parts of the story that made tangent to my understanding and I think I will re read this book sometimes again in future. The Tiger’s Wife is an ambitious novel for a debut. It is complex, multi layered and has fable and reality intricately woven. The writing style is mature, seasoned and polished. It allures you to delve deeper in the story and visualize the scenes in your mind. I liked the fact that the author has not made any judgment on the folklore and has left it to the reader’s imagination. Had there not been a picture and a short bio data of the author at the end of the book, I would not have believed that the author is just 25 years old! She is the youngest author on the New Yorker's Top'20 writer under 40' list. I will definitely look forward to more of her work. I have seen this title in a few places recently but yours is the first review I have read, thankyou as you have tempted me enough to add it to My Wishlist. Also Happy Birthday for earlier this week, hope you had a good one.